Unemployment in Scotland fell by 8,000, to 208,000 in the period January to March 2011, according to Office for National Statistics (ONS) data released today. The Scottish unemployment rate is 7.7 per cent, the same as the UK average. The labour market statistics also show employment in Scotland has fallen by 4,000 over the three months to January - March 2011. The number of those in employment in Scotland now stands at 2,482,000. 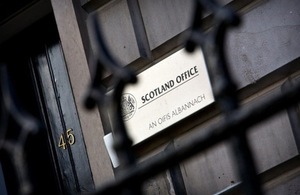 “A significant drop in Scottish unemployment during the first quarter of 2011 is undoubtedly good news. Every person who leaves unemployment and gets into work is a step in the right direction. “The UK Government knows it cannot be complacent on this issue and that is why we are putting our efforts continuing to create the conditions for growth. “There has been a lot of change in Scottish politics in recent weeks but no one at either Westminster or Holyrood should forget our main and immediate priority is the economy. It is business as usual when it comes to getting Scotland back into work. Employment in Scotland fell by 4,000 over the quarter, and increased by 46,000 over the year, to stand at 2,482,000. - The Scots employment rate increased over the quarter to 71.2 per cent. The rate is above the UK average of 70.7 per cent. - Unemployment in Scotland fell by 8,000 over the quarter. The level now stands at 208,000. - At 7.7 per cent, the Scots unemployment rate is same as the average for the whole of the UK. Economic Activity level fell by 12,000 over the quarter and now stands at 2,690,000. The Economic Activity rate fell slightly over the quarter, and stands at 77.3 per cent. - In April 2011, the number of people out of work and claiming Jobseekers Allowance (JSA) was 137,600. This represents an increase of 200 over the month, and is the first increase since the beginning of the year. The Labour Force Survey (LFS) indicates that the number of people in employment in Scotland from January to March 2011 was 2,482,000. Employment was down by 4,000 compared to the previous three months, and up by 46,000 compared to the same period last year. The employment rate increased by 0.1 per cent over the quarter, and increased 1.2 per cent over the year, to 71.2 per cent. In comparison, the Scottish employment rate is above the UK average. Unemployment in Scotland was down 8,000 over the quarter January to March 2011, to 208,000. The level was down 10,000 compared to the same quarter last year. The unemployment rate was down 0.3 p.p. from the previous quarter to 7.7 per cent, which is down 0.5 p.p. over the year. The claimant count in Scotland, based on the seasonally adjusted number of people claiming Job Seeker’s Allowance (JSA), increased by 200 from March, to 137,400 in April 2011. The level is up by 2,400 on April 2010. The claimant count rate is unchanged over the month at 5.1 per cent, and up by 0.1 p.p. over the year. Note, that claimant count figures for the last month have been revised. The number of economically active (defined as those in employment or ILO unemployed, and seasonally adjusted) in Scotland in the January to March 2011 quarter was 2,690,000. This was down 12,000 on the previous quarter, and up 36,000 on the same point a year ago. Among those aged 16-64 the economic activity rate was 77.3 per cent, down 0.1 p.p. on the previous quarter, and up 0.9 p.p. over the year. The internationally comparable International Labour Organisation (ILO) measure of unemployment is the headline figure published by the Office for National Statistics (ONS) for UK regions/countries. The ILO measure of unemployment, which is derived from the Labour Force Survey (LFS), is published 12 times a year for an average of three consecutive months, so the May publication will show the average for January - March. ONS recommend that seasonally adjusted data should be compared with the previous non-overlapping three-month period: i.e. January ¿ March data should be compared with October - December data. Quarter to quarter changes at country/regional level are especially subject to sampling variability and should be interpreted in the context of changes over several quarters. The count of those claiming unemployment-related benefits continues to provide a full and timely range of data at sub-Scotland level for local authorities, Travel to Work Areas (TTWAs) and parliamentary constituencies. The claimant count is also the main source of information on unemployment by age and duration. Data on the claimant count in the New Deal age and duration groups is available from 1985. The ILO measure of unemployment defines unemployed people as those who are; without a job, want a job, have actively sought work in the last four weeks and are available to start work in the next two weeks or; out of work, have a found a job and are waiting to start in the next two weeks. The claimant count measures the number of people claiming Jobseeker’s Allowance benefits. The claimant count measure is always the lower measure because some unemployed people are not entitled to claim benefits, or choose not to do so. Economic activity is a measure of those who are in employment plus those who are unemployed but are available to enter the labour market (ILO unemployed). Conversely, the economically inactive are those people who are not in employment, but do not fulfill all the ILO criteria to be classified as unemployed. The most common reasons given for inactivity are being a student, being retired, looking after a family or home and being long-term sick or disabled. Select the link “Regional Monthly Data - May 2011” which will prompt you to unzip a folder of Excel files. Then select the file “LMSScot0910” to access the data.